Edible flowers are a fun and an easy way to add color and flavor to all sorts of dishes. Take a moment and watch my latest video on edible flowers and learn so many ways you can incorporate them into your life. Nothing says "gourmet" like a sprinkling of colorful flower petals in a salad, a handful of pansy petals on a birthday cake or a sautéed daylily bud in a stir fry. Edible flowers are a fun and an easy way to add color and flavor to all sorts of dishes. 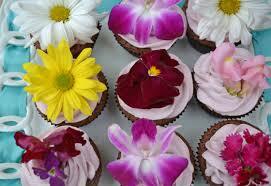 Most edible flowers are best eaten raw--simply pick and rinse with water. Flowers will taste and look their best right after they have opened, rather than after they have been open for a few days. Kids love to grow their own edible flowers and you can decorate cupcakes, use the petals in pancake batter or freeze them in ice cubes. There are two important things to remember about edible flowers: first is that not every flower is edible, and the second caution is to avoid flowers that may have been sprayed with an insecticide, fungicide or herbicide. Some flowers can be poisonous. So get the flowers from a reputable source or stick with flowers listed below. Borage: This fuzzy-leaved herb has sky-blue flowers with a light cucumber taste. Add to fruit salads, green salads or freeze in ice cubes for cold drinks. Calendula: An easy and prolific edible flower that's easy to grow from seed right in the garden. Separate the petals from the center of the flower and sprinkle the petals into salads. Colors range from pure yellow to orange and red. Remove spent flowers and the plants will bloom continuously from early summer into late fall. Chamomile: English chamomile has small, daisy-like flowers with an apple-like flavor. If you're allergic to ragweed, you might want to avoid chamomile. Marigolds: Use the tiny flowers of signet marigolds, such as Lemon Gem and Tangerine Gem. Their blossoms have a citrus taste. Nasturtiums: Blossoms have a peppery flavor like watercress. All colors and varieties are tasty in salads or as garnishes. Leaves can be eaten, too. Pansies : These flowers have a wintergreen flavor and are pretty on cakes and other desserts. 1. Use only the freshest and most unblemished violets. Put violet petals in a deep bowl and pour the boiling water over them. Make sure violets are submerged so weigh down with a heavy dish. Leave on counter at room temperature for 24 hours. 2. Line a colander with layers of rinsed cheesecloth and place over a bowl. Pour violets and liquid into colander, squeezing out juice from the violets you can discard the violets. 3. Place sugar, lemon juice and water in a saucepan and boil it will turn into a very thick syrup. 4. When the liquid becomes near the candy stage add violet water and bring to a rolling boil. Boil 10 minutes or until thickened. Pour into sterile bottles. Allow to cool, then seal and refrigerate. Serve with ice water, seltzer, or pour over pancakes or French toast. VARIATION: Substitute 4 cups fragrant rose petals and add 1 cinnamon stick per bottle of syrup. Yield: 2 quarts.